ceenindee wrote: "Baseball with the Cullens"
A tribute to the summer squall. To bring out once more the bat and ball. As soon as Alice starts to play. A ruckus that is never heard. Edward on second, stealing third. The sun comes out; the game is over. By now the visitors are sullen. 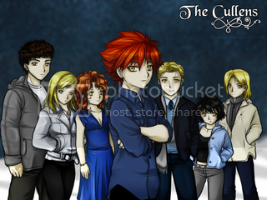 'Cause no one plays baseball quite like the Cullens. I've loved everyone's poetry so far. I write most of my poetry during stressful or depressing situations as a means to release my emotions so I rarely let anyone read it because it's so personal. But I do have some poems that aren't specific to a situation. This one is kind of random. I don't remember having anything particular in mind when I wrote it. It was just a general feeling. I watch and I listen. The sun has awaken and I must go. This poem I wrote for school. It's depressing but my teacher really liked it. Share you opinions about it. It's depressing but my family was going through a tough time when I wrote it. i wrote this poem with a different human-vampire couple in mind, but I thought I'd pass it along anyway. A rippling current through their souls. This love could work, but not as such. Perhaps if they’d played different roles. She wishes he could share her bed. She drifts to sleep – he fills her head. The closeness they so deeply need. “She’s not your kind.” That’s just a rant. On hope they thrive. On love they feed. Becoming one with shared tomorrows. And live their lives in quiet sorrow. NKistheshiz wrote: This poem I wrote for school. It's depressing but my teacher really liked it. This is a wonderful, powerful poem. I think some of the best poetry is based on life experiences. Thanks for sharing! Thank you so much. I was in the zone while writing it, lol. I like you're poem too. It's so good. It was written really well. I could actually like see myself there. It was awesome. That for her, I’m the best. Explain things so she’ll know. I just can’t let her go. To be with me, not him. I may never understand what he sees in me. I stand in the shadow of his radiance. Why not someone whose beauty rivals his? Everything he wants and more. His compliments make me laugh. Perfection applauding chaos, I’d say. His love is sometimes frightening. Can I meet his expectations? That without me he’d be lost. For a future of endless tomorrows. No one could be as fortunate as me. I’ve found him, and he’s mine forever. Ageless perfection held in human hands.